Enemy of the Sun escaped me in 1993. In 2010, it's been a fixation. I received a copy in the mail maybe two weeks ago, no doubt a result of the ink I offered the Neurosis reissue back in May. That was an exciting package to open: all black matte slipcover, silver reconsideration of the dilapidated and deteriorating face and figure on its otherwise apocalyptic cover, the fires now arterial translations of the fiery background. Something about the slipcover seems a sophisticate's variation of "menacing," but the doom therein is somehow more threatening with a cover this understated. That became apparent once "Lost" reached that operatic tone when fallen seraphim seemed to willingly organize choir-like behind the heavy walls of guitar and sound loops abruptly appeared and repeated nonsensically within the band's assault. The effect is both captivating and unsettling, and I was very much entranced by what I'd heard and interested in what was to follow. 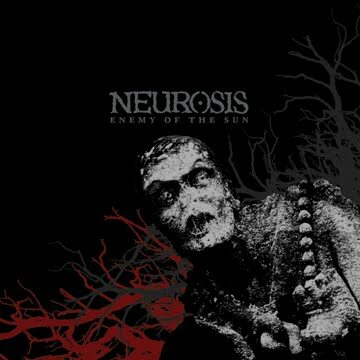 Neurosis' Enemy of the Sun is widely considered to be their most accomplished work, a veritable Pet Sounds of thick progression, crescendo-heavy sludge and ceremonial percussion. When Enemy Of The Sun was released in 1993, Tool's Undertow was bringing progressive music to MTV and reintroducing the genre's pretension and skill to the radio, albeit with a more accessible tone that was easier to digest. Even at a time when Alternative music was still king and the airwaves were spilling aural abrasions everywhere to the so-called "converted," Neurosis had cult status. An album like could only have been made by a band with cult status. Even with minimal acknowledgment of the music's brutality and wicked drone, the band's experimental approach to journalistic soundbytes and cut-n-paste editing seem relatively avant for the time, played in quick and constant cycles or stretched into long undulating sheets of spoken nonsense. The album's ponderous and patient tension spills out as sonic runoff and collects somewhere darker, the music always glad to accommodate the mood. "Raze The Stray" is demonstrative of this tension, its opening song (vocal by Erika Little) pretty enough before crushing drums, long screams and squealing guitars sort of roll in and then disappear, leaving behind an acoustic instrumental. Eventually, the song transitions into a wallowing wall of ooze that shifts into a strident seesaw of chord changes. There's something primordial about "Raze The Stray," its crawl and struggle sporadically gifted moments of ease where the song seems to find a soft spot or two. After an interesting news item about a Buddhist monk that's set ablaze, ("Burning Flesh In Year Of Pig"), "Cold Ascending" and "Lexicon," medley-like, take the impending doom of their intro and launch into a very furious series of chords that seem to run ahead before they're pulled back. Midway, "Lexicon" hypnotically trudges bass heavy while the wavering throat of what could be an old man offers a strangled melody. The song eventually dissipates underneath the weight of bubbling distortion, leading into "Enemy Of The Sun." The title track is a grand gesture, appropriately strong and then mysteriously peaceful. Past the four minute mark, not too far from the five, percussion is kicked up and you can sort see the precum from Tool's Ænima begin to glisten. "The Time Of The Beasts" is essentially dragged out blues music, accented by hefty distortion and brass that leads into static-clung crescendos of dueling guitar noise and pummeling bass rhythm. Piano notes lead into the nine-manned drum circle called "Cleanse," which is, at points, accompanied by a didgeridoo. Originally, the album ended with fifteen plus minutes of drum play, but the reissue offers the demo version of "Takeahnase" from 1992's Souls At Zero and "Cleanse II (Live In Oberhausen)," which was recorded in 1996. "Cleanse II" I especially like as a reconsidered ending for the Enemy Of The Sun. It follows the album's feel and construct well enough, the fact that it's a live recording inconsequential next to its use of sampling and live sound orchestration, the words "we shall never look back" reiterated over and over again to a crowd then unaware that the recording would later surface on the results of Neurosis' looking back.